According to statistics, we all do! That’s why, in this article, I’ve put together 8 awesome infographics to review all powerful traffic strategies. By the end of this article, you will learn lots of practical ways to INCREASE YOUR WEBSITE TRAFFIC. First, let’s take a look at a survey by Hubspot to see what are the major traffic sources. According to a traffic report of analyzing 15k websites by Hubspot, #1 website traffic source in most industries is organic traffic. I know! Creating viral content is not the easiest part of your content marketing journey. There are some proven ways that are guaranteed to increase your content’s viral potential. SEO is the #1 traffic source for most B2B and B2C industries. As you may already know, long tail SEO is one of the most powerful ways to get search engine traffics to your website. HitTail.com has gathered the necessary information about the long tail myth in this infographic. This infographic does not load properly here but you can see it in the original article. We all agree that social media is powerful and it’s a firm part of every content marketer’s plan! In this infographic provided by RazorSocial we will take a look at different ways to optimize your post for social media, so they get shared more often. Advertising has been always a solid way of getting targeted traffic to your website. If you know your numbers it can be pretty effective and if you don’t know your numbers it can help you find them faster. You can use different models and different places to promote your online business. YOU HAVE VARIOUS OPTIONS TO CHOOSE FROM! In this infographic, BookMark.com has created a beginner’s guide to learn about different advertising options. Google PPC is another huge source of traffic. Considering the fact that advertising on Google is not very cheap these days, it’s rewarding to know the basic rules of PPC advertising for maximizing your ROI. In this perfect infographic, Visualistan.com has put together all the info you may need for running and optimizing your PPC campaign. No matter how great your content is, it won’t get viral unless you promote it well. PROMOTION IS MORE IMPORTANT THAN THE CONTENT ITSELF. CrazyEgg.com has put together promotional strategies in this handy infographic. In our last infographic provided by Digital Vidya, you can learn about 27 actionable tips that will help you take your content marketing to a whole new level. You have lots of options to promote your content. Which strategies should I stick to? The answer is mind-blowing simple! The ones that you are having better results with. You should know your audience and analyze their behavior. You should test different strategies and see what works best for you. When you are testing, do it the right way! Always, learn from people that are highly successful in a particular field before jumping into that field. No matter what are your main traffic sources is, you should always keep in mind that YOU SHOULD ADD VALUE. If you are using FaceBook to get traffic, share contents that your audience loves to share it with their followers. If you are getting traffic from Google, create or curate content that is practical and actually answers your visitor’s problem. If you are advertising for your business, put the perfect product or solution in front of your visitors. And the idea is the same for any other traffic source. THINK ABOUT YOUR WEBSITE’S VISITORS FIRST AND DO YOUR BEST TO ADD VALUE. Which traffic strategies have been working best for you? Do you know other traffic sources that worth sharing with our audience? These infographics are very helpful when considering and planning how and where to market your website. I like the fact that you made sure to show graphics in your article as well. I think for me, marketing and consistency has been one of the toughest things for me to get right. What do you think about consistency of posts? is it enough that I post about 4 to 5 times a week? Consistency is very important and publishing 4 articles per week is great! Always keep in mind that the most important thing is to publish high-quality content. If it’s hard to publish 4 high-quality content in a week, publish less but keep the quality as high as you can. Make sure your articles are readable and always try to read your visitors mind and try to think like them. This way you can give them exactly what they are looking for and that’s what matters the most. I really enjoy this article and all the graphics that come with. I’m already implementing some tactics suggested in this website. I think asking people to share my content is what I struggle with most. But now I’m looking into the plug-ins. Also using info graphs is a great idea. I’m going to have to try out the long content idea. What I’ve discovered especially with social media today that people don’t exactly have longing attention spans. The content itself must be really really good, Which it should be. Do you think that individual points should be separate Pages on the website or should be listed as you have it set on the site? I like to revisit content that is particular to my situation and easy to find. You are absolutely right! The content itself should be good to engage visitors. Because, all of them are somehow related to each other, I put them in one page but thank you for the feedback. Hopefully, I will publish more info about each section in a separate page in the near future. 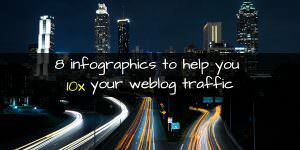 I’ve heard from other successful marketers that infographics can increase website traffic. And looking at the awesome infographics within your article, I can see why they make visitors hang around for much longer as well as attract new ones from various traffic sources like Google and scial media (namely Pinterest). I had tried to create my own infographics in the past, but I totally sucked at it because I didn’t know how to structure them the right way and also make them visually appealing to my audience. How long do you reckon it would take for me to make a good attention-grabbing infographic and where’s the best place for creating them? Better still, where can I find the best training platform for creating awesome infographics like the ones here? These are very useful and helpful tips and tactics that I am definitely going to use when creating new and updating my existing content as well, thank You very much! I truly appreciate the amount of visual information and graphics You used here, it truly helps to process the information much better and learn much more in comparison to article with just regular text, great job! You have done a great job with this roundup post putting together all the infographics and explained each strategy in detail to drive up traffic to our website. I’ve implemented most of the tactics suggested herein, but haven’t started with video marketing especially nowadays Youtube is the second largest search engine for organic traffic. The toughest part is to create an appealing video and how to optimize it. What would be your SEO strategies for creating a viral video marketing. What an amazing page you have. This is one of the best posts I have seen for a long time and I can see areas on my site where I need to improve. I am going to spend the rest of the afternoon summarizing your post (a downloadable summary would be a great idea). I loved the well created images, but not only that the content was really good and points that I can action into my posts to make my site better. Ash what a tremendous guide. Amazing how some tweaking and openness to new ideas increases your blog traffic by epic levels.